I have this friend at the gym, his name is Sonny(real name). I’d see him fairly regularly and we got to chatting a few times and somehow or other we got onto the topic of kids and ADHD and that sort of thing. He told me that when he was in Grade School he was diagnosed with ADHD. His grandfather found out about this and thought it was a ridiculous. He took Sonny and enrolled him in a martial arts class. This allowed Sonny, according to him to burn off the natural access energy that was driving him to fidget for those horrible six-seven hour days in school. He told me that pretty much from that day on he had no problems and it was much easier to concentrate in class. Someone who adamantly believes in the theory of ‘Chemical Imbalance’ in the brain, might say that Sonny didn’t really have ADHD. If that were the case, then the person who diagnosed him should be seriously reprimanded, fined and likely have their licence revoked. ‘“In Brazil the dominant approach is psychoanalytical and Brazilians tend to disregard biological mechanisms,” says Aase. Again, if ADHD was a biologically based ‘disease’ this would not be possible; you would not be able to treat a biological mechanism by using psychological means. Add to this that there are no real standard methods of diagnosis, which is continuously admitted throughout literature on the subject, and you have a real confusion as to causes and cures. I’m sure some psychiatrist could ‘fake news’ his or her way through this to make it all seem confusing and invalid. In my research, I’ve seen ‘researchers’(I use that term very loosely), doctors and such, comment on the factualness of the biochemical nature of issues like ADHD and Depression. I have, in all of my research, and believe me I’ve done lots, found no factual studies that confirm any biochemical causes for the above so called ‘diseases’. So many people are diagnosed with Depression and Clinical Depression. I see every year or two some article about some researcher is on the cusp of the discovery of exactly what chemical imbalance in the brain causes depression. Trying to give more credibility to the concept but at the same time admitting that there is no scientific evidence validating any kind of biochemical cause. Again, there are so many people diagnosed with ‘depression’ that are able to overcome it without resorting to drugs. So, they are either misdiagnosed or it is NOT biochemical. I read a quote recently that pointed out that people that have more challenges in life are happier. My observation is that when people are doing something or producing something, they are always happier. And the person who is doing something and at the same time helping others is the happiest of all. I’ve observed that those having the most difficulty with depression and such are constantly worried about things instead of getting on with it and actually challenging themselves in life. A slightly ‘dangerous’ environment keeps you awake and doesn’t give you time to worry about being depressed. I’m not saying you should put yourself in ‘bad’ situations but make a bigger game and start solving the problems of that game. Stop thinking so much. If you have time to sit around that think, then you, for sure are not going to be happy. The thing that really gets me on this is that so many people have accepted the idea of things like depression and ADHD being physical diseases as FACT, when there is no proof at all. But I guess this is just more evidence of blindly accepting ‘fake news’ as is now done daily on social media. I guess if you say an untruth enough times it becomes true. Or at least believed to be. Who Decides What Becomes a Mental Disease? 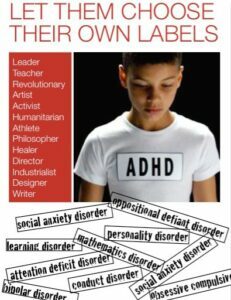 who decides at what point an active boy becomes ADHD? who decides at what point a liking for neatness and order becomes OCD? who decides when sadness becomes depression? who decides when an ‘emotional roller coaster’ becomes Bipolar? who decides when a cheeky kid is suffering from "oppositional defiance disorder"? ADD or ADHD Or Just An Active Little Boy? Before ‘ADHD’ we were just active boys. Likely too much sugar. Either way, if we were too rambunctious we would be send outside to play and burn off some extra energy. At school there was enough physical activity and breaks from academics to bleed off any extra energy. 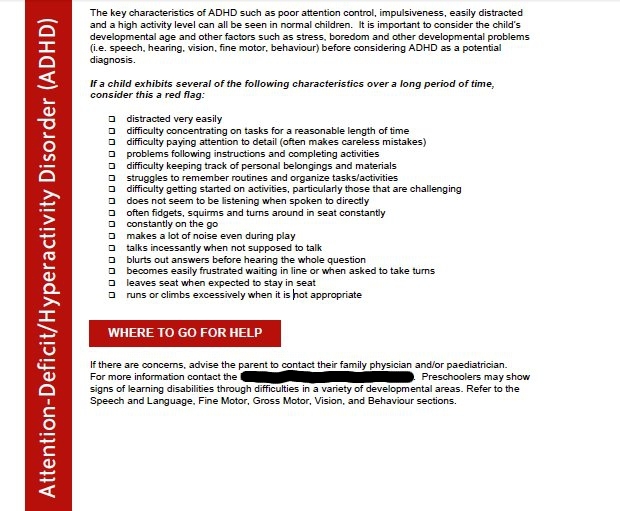 An acquaintance of mine, Sonny, at the gym, was diagnosed ADHD when 7 years old. The teachers wanted to put him on Ritalin. His grandfather stepped in and said no. Grandfather enrolled Sonny in a martial arts class. He says it helped him burn off energy and stay focused. I can’t remember not being outside after school winter or summer. On weekends we would head to the farm and in winter we would head out into the woods for hours. Come back when time to leave stiff from the cold and wet from falling through the ice. There are myriad solutions online for ADHD. Above are just a couple of sites. I don’t necessarily agree that there is anything wrong with a 8 or 10 year old boy that needs to be active. BUT if you do and want to ‘solve it’, then there are dozens of ways to help your child without drugs. Of course, I do understand if you need the quick fix of a drug to control and keep your child quiet. Your life is more important than your child’s. I’m not really apologetic about the sarcasm - people need to spend more time with their kids. Not just give them everything they want. Some schools have taken away parts of education that are not academic. Big mistake. Is there a test, physical or otherwise for OCD? I don’t think so. Who makes the line in the sand? On this side you just like things orderly and clean. On the other side you have a mental problem because you like things orderly, neat and clean. Huh? The headshrinkers would have you believe that 1 in 4 or 5 are in need of psychiatric help. It is not that hard to convince someone they need some help but when that help comes in the form of a pill that is addictive and has side effects that include depression, suicide thoughts and death, well, let’s not terrify this person more than they already might be. Oppositional Defiance Disorder(Or Just Cheeky)? The ‘cheeky’ kid that gets into trouble because he disagrees with the teacher. He is not convinced and won’t take things at face value. He is light hearted about it and is seen as somewhat condescending when in reality he is way ahead of the curve but the teacher or parent finds this disrupting to the rest of the children largely because this ‘defiant’ child is just too smart. But because he doesn’t fit in or just believe all he is told, he gets a prescription to subdue him. There is no physical or mental test to determine at what point these kids need to be drugged. It’s all opinion. The psychiatrist listens to the parent or teacher and prescribes a drug. That simple. A caring person would have a conversation with the child, teacher and parents to see how to encourage and challenge the child. Drugs are ‘easier’. drugs are stripping away the life of upcoming generations and pretty much destroying any willingness to fight back. 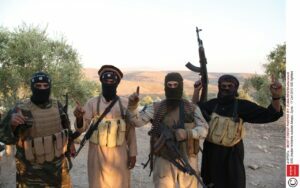 ISIS would be smart to just finance the field of psychiatry and the job of destroying America would be done for them. This is an amazing Ted Talks by Julia Rucklidge, a clinical psychologist. She talks about the various success rates of nutrition, micro supplements and pharmaceutical drugs in treating such things as depression, anxiety, PTSD and ADHD. Loaded with studies from around the world. Health Canada is not a ‘nice’ organization. I’m convinced their purpose is not to help people. Which is kind of sad. I’m sure that staff and executives have themselves convinced that the general population of Canada is “too stupid to understand” but I’m sure that the average Canadian has a much higher intelligence and ethical standard than any executive or employee of Health Canada. When someone withholds vital information, which is explained more in the article below, then, as anyone knows they have acts that they are not proud of and more than likely they could be seriously censured for. There are numerous documented deaths resulting from ADHD drugs that are prescribed to children and Health Canada will not release information to parents, or anyone for that matter, about potential side effects of any of these drugs. As usual, one of the major criminal organizations involved in the manufacture and peddling of these dangerous drugs, Eli Lilly, would not comment. Doctors often prescribe drugs for ADHD without knowing their side effects. If you are researching this and your doctor has prescribed drug for your child such as Concerta, Strattera and Biphentin ask, insist that he supply a list of possible side-effects before allowing them to be administered. Ask this of anyone that insists that your child be administered these drugs. Attention Deficit/Hyperactivity Disorder – A Joke? I have always thought that the characteristics that defined Attention Deficit Disorder was pretty much the same definition that one would make for an active, healthy, young boy. This is the most recent incarnation of the description of ADHD that give psychiatrists and doctors an excuse to drug out children. More often than not it is the parent’s or teacher’s intolerance and impatience than anything that the child is doing wrong. One should always get a complete physical before taking any mood-altering drug if diagnosed for depression, bipolar disease, ADHD or similar so-called diseases. Insist on a thorough examination. Most doctors in the US and Canada are paid a certain amount of money per visit. They are generally allowed a very short time to do their diagnosis. Because of this, many cannot afford the time to do a proper investigation into your symptoms and will often prescribe a drug such as Prozac or Zoloft or such that handles the symptoms and masks the real cause of the problem. The other problem that doctors often run into is that patients come in to their offices asking for a drug that they have seen advertised on TV. More often than not the doctor knows very little about the drug and they have been known to hand out a prescription without proper research of their own. Again, given the limited time allowed a doctor by an HMO (Health Maintenance Organization – Group Health), they rarely are able to get enough information to properly diagnose. In the US and Canada there are licensing boards that are supposed to oversee the quality of care. In Canada, there is not much useful information as to whether a doctor is ethical or not. They tend to protect their own. There is a bit more information on the websites of the licensing boards in the US where each state has its own. Here you can often find out if a doctor has be sued for malpractice or whether he or she has been disciplined and other information. We suggest that when searching for a doctor, ask your friends or at a local health food store. This will probably be more effective than checking the above sources. Look for one that will take the time to help you find the real problem for you or your family. Getting the proper diagnosis should result in one feeling better, being more energetic and more productive. If one is more productive, well, it snowballs, one will always feel better when they are more productive.